TORONTO — Another former Tiger-Cat has switched sides in the battle of Ontario, as the Toronto Argonauts announced Friday the addition of international linebacker and defensive back Rico Murray. The 29-year-old spent four seasons with the Ticats at multiple positions, including halfback and SAM linebacker. The news comes a couple of weeks after the Argos added former Ticats Johnny Sears Jr. and Peter Dyakowski. 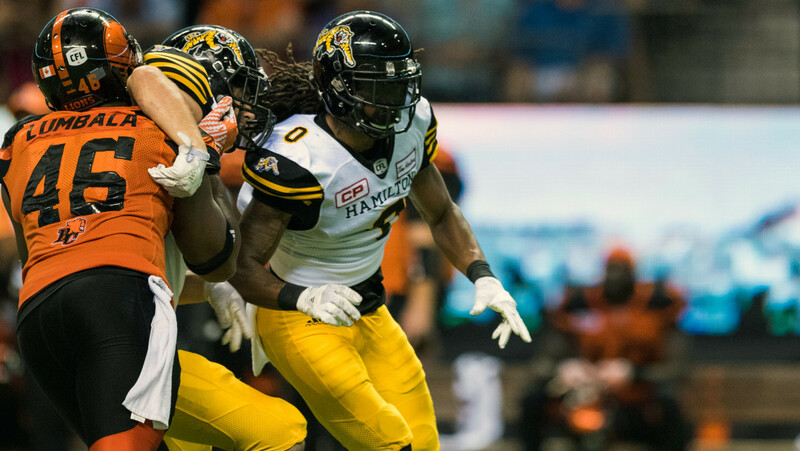 In 50 games across four seasons with the Ticats, he registered 180 tackles, 11 special teams tackles, three sacks, nine interceptions, one of which was returned for a touchdown, and four forced fumbles. The 5-foot-11, 203-pound native of Cincinnati, Ohio, had his most productive season in Black and Gold in 2014 when he notched career highs in tackles (59), interceptions (5) and forced fumbles (3) en route to being named an East Division All-Star and assisting the Tiger-Cats to a second consecutive Grey Cup appearance. Murray, a Kent State product, played 47 games over four seasons with the Golden Flashes, recording 218 defensive tackles (125 solo, 93 assisted), four interceptions, three forced fumbles, two fumble recoveries and 18 pass breakups. Following his career at KSU, he spent time with NFL’s Cincinnati Bengals and the Edmonton Eskimos. With free agent Brandon Isaac unsigned, it’s possible Murray winds up playing SAM linebacker for the Boatmen in 2017.